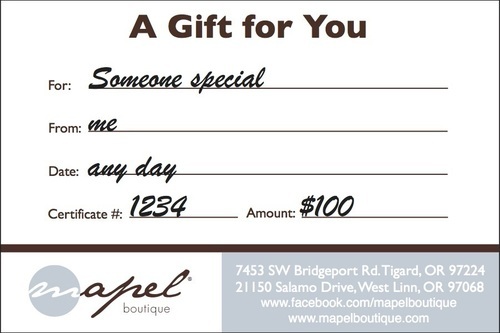 Treat someone special with a Mapel Boutique gift card! Whether its for the holidays, a birthday, or just because, a gift card is the perfect (and speediest) way to send something special! Gift cards instructions on how to redeem will be included in email confirmation. Purchaser will receive an email confirmation with instruction on how gift card can be redeemed online or in store and a printable gift card for immediate gift giving. A hard copy will be mailed to "shipping address". Our gift cards have no additional processing fees and never expire!